Sorry, didn’t mean to make a post out of this, was just trying to upload a photo with my iphone. Anyhow, since it posted, I may as well share and give an update since it’s been a while. I’ve been busy moving the last 10 months or so for a new job and finally getting my garage back in order to start building again. Basically, got a new job, had to finish the old house remodel, sell most everything, rent out the old house, move to a temporary apartment while house hunting, and just finally bought a second home and moved in about a month ago. Moved to Bend, OR which is about 3 hours north of the old homestead and now living the life of my dream job. Still settling in, but finally feeling like I have some time to play again. This is my custom framed two seater, 17″ of travel in front and 18″ in the rear. Motor is a GSXR600, Fox 2.0 air shocks. Designed and modeled the frame myself. Only 55″ wide (trail friendly), I wanted it to be capable of running through most trails at the dunes and also super light weight. 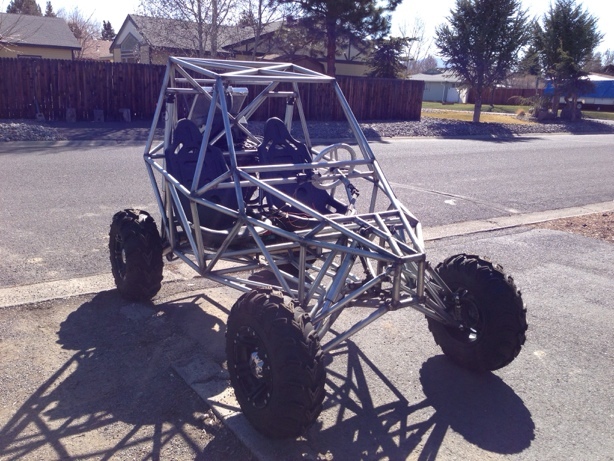 Frame alone is only about 150lb, hoping the total buggy weight is under 7-800lb. Been building it for about two years now, little by little. Chain drive rear allows more suspension travel for the narrow width. Modeled it after some truggy designs with the live jackshaft through the trailing arms. And here are a couple of pics of the kids buggy I built before, still a bit of a work in progress but a cool toy for the kids to drive around. It has a 16hp 420cc industrial motor with a comet 500 CVT. My better half and daughter testing out the kids buggy at CoosBay dunes. Anyhow, nothing new on the liquidlabs front, but I am finally all moved and finished with remodeling my old house/renting it out. Time to start playing yet again. Figured I’d start some tinkering on the buggies first then maybe do some more PC stuff this winter when the garage gets too cold. We’ll see..but that’s what I’ve been up to…moving…now playing with buggies.